We want you to be happy! 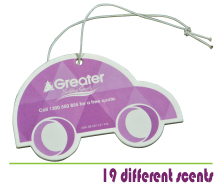 Not all Promotional Air Fresheners are the same. 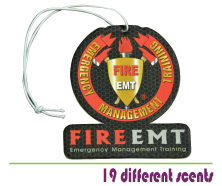 These are high grade with longer lasting scents. 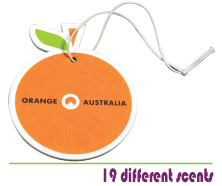 With 19 different scents to choose from your next promo will be smelling like roses too! 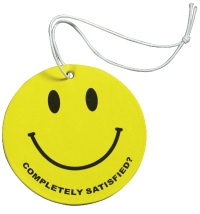 The best range of Promotional Air Fresheners: Welcome! 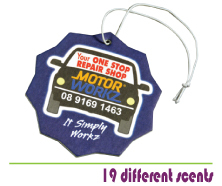 AirFreshenerPromotions.com.au offers your great value buying when you need Promo Air Fresheners. 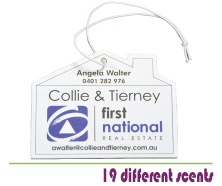 We have the best value range in Australia: our focus is giving you the highest quality fresheners, at the lowest prices in the fastest possible timeframes. 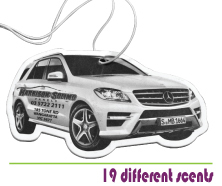 19 different scents are available: New Car, Ocean, Green Apple, Cool Water, Forest Berry, Cherry, Cocunut, Lemon, Pineapple, Strawberry, Watermelon, Cinnamon, Forest, Jamine, Lavender, Bubblegum, Chanel Fragrance, Cologne Fragrance and Christmas Tree. Our client base is spread all over Australia: Sydney, Melbourne, Brisbane, Perth and all stops inbetween, we deliver nationwide. Our customers range in size and type but we specialise in serving the mechanical and auto trades. Regardless of your size it is our goal to help you as best we can! 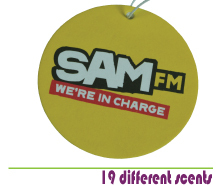 ~ Air Fresheners direct from the factory ensuring you great quality supplies. ~ Choose between stock shapes or for a small surcharge have any shape you custom shape you want! 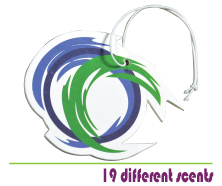 ~ All our Fresheners are supplied ina POLYFRESH Bag for lasting promos! ~ 19 popular fragrances: one will suit your brand. We are looking forward to helping you with your order!